When I was five my dad and I would go out to the pond in our apartment home and toss bread to the friendly ducks. I remember the experience to this day, sharing a snack with my favorite birds. Nothing made me feel more in touch with nature than seeing them all waddle toward me and childishly ripping off pieces. Now what if I told you that bread is unhealthy and potentially dangerous for the ducks. Shocking right! 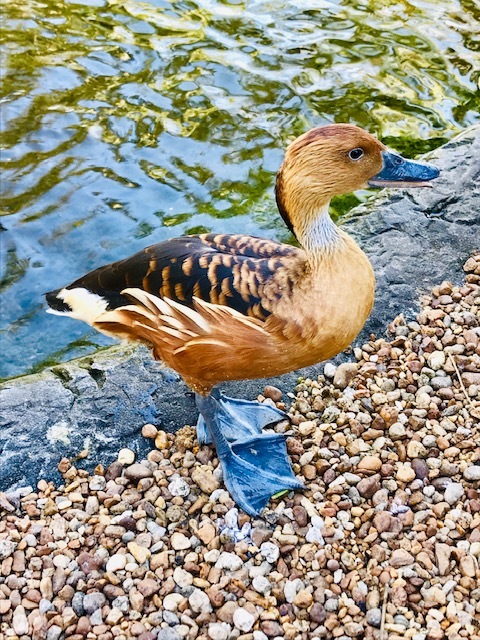 Here in many of our apartment homes we have bodies of water that are home to many birds, one of these birds being the Mottled Duck. Now I see families here at Camden sharing in the same pastime I had. Follow along to see what bread does to Ducks but more importantly what safer options we can feed our friends to keep them healthier! Bread and many of its counterparts are packed with carbohydrates. They in themselves offer very little nutritional value. Think of how too much bread leads to weight gain in humans, leaving them feeling sluggish and bloated. Similar side effects happen to ducks. Bread can lead to excessive weight gain and other health problems, read along to find out more! Just like human babies, ducklings require a varied diet with lots of nutrients.Ducklings receive a balance diet from natural plants and insect proteins, this helps them grow properly. Now if we replace that diet with bread, fed by humans, ducklings growth can be stunted at a time that is most important. This can lead to many issues such as the ducklings being weighed down and an inability to fly and “angle wing” or “slipped wing” where the last joint of the wing is twisted with the wing feathers. Not all the bread tossed out will be eaten by the ducks. So, what happens to the leftover bread as it floats away? The bread can leave a dent in the environment and its surroundings. When bread begins to breakdown it produces a mold which in turn leads to a certain strain of algae. These algae don’t always agree with plant life. This pesky creation can clog waterways and crowed out vital plant growth. Leaving many fish and other amphibians homeless and hungry. What happens when ducks only rely on humans for food? They lose their natural instincts- which is to forage for plant life and insects. Instead they become lazy and view humans as the source to their hunger and survival. This can become increasingly dangerous when ducks are in a populated area. The fear of humans subsides, and this can lead to ducks crossing busy road ways or approaching humans for food- nipping and quacking for their handouts. What are some better options to feed ducks? We all enjoying being close to nature, but what are some healthier options to feed our favorite feathered friends? The joy of feeding ducks doesn't' have to come to an end. There are other healthier and safer options for sharing quality time with nature when we are at home or in our Apartment Communities! Cities Atlanta Metro Austin Metro Charlotte Metro Corpus Christi Metro DC Maryland Metro DC Metro DC Virginia Metro Dallas/Fort Worth Metro Denver Metro Houston Metro Inland Empire Metro LA/Orange County Metro Orlando Metro Phoenix Metro Raleigh Metro San Diego Metro Southeast Florida Metro Tampa Metro Tags Birds.Duck.Wildlife.Outdoors.Activities. Foods.Healthy.Organic.Nature.